Whilst our team of Podiatrists can provide specific Lower Limb and Foot treatments, our Physiotherapists add much more. What can our Physiotherapists treat? The basic aim of physiotherapy is to help alleviate pain and restore normal movement and function patterns to help return the body to its natural state. Physiotherapy includes the assessment, diagnosis, planning, intervention and evaluation of patients treatment. Patient treatments include massage, mobilisation, manipulation, electrotherapy and with a strong emphasis on remedial exercise therapy. InMotion Clinics welcomed the former 10 Bridge physiotherapy clinic mid-2018. 10 Bridge had already developed an excellent reputation for its expertise in the management of patients with musculoskeletal problems. It’s founder, Mark Browes was previously recruited to be first team Physio for Liverpool FC. We combine traditional physiotherapy treatment including manipulation, mobilisation, massage, acupuncture, ultrasound, interferential, TENS and specific exercise therapy. Our fully qualified and experienced physiotherapists are able to treat a wide variety of problems – from back, neck and pelvic pain, to pre and post operative care and specific soft tissue damage. We are unique as a Physiotherapy service in Chester, in that we offer musculoskeletal physio (joints, soft tissue and muscle problems) and we also offer a leading NeuroPhysio service. Kavitha Ajesh is a highly experienced Physio, with specialist training in the management of Neurological conditions (post-stroke, multiple sclerosisand Parkinson’s disease physical therapy… and much more. She previously worked at the NeuroTherapy centre and St Christopher’s Neurological Hospital in Chester. Our physiotherapists are members of the Chartered Society of Physiotherapy, the Organisation of Physiotherapists in Private Practice, and are registered with the Health Professions Council. What happens in our Physiotherapy Appointments? Our practitioners are chartered, graduate physiotherapists. They have a history of high-grade senior NHS posts. They use manual therapy techniques, mobilisations and/or massage, acupuncture and lifestyle management disciplines as needed. In your assessment, it is important that we take your medical history to establish exactly what medical conditions and/or prescriptions may be affecting you. This will help us understand the many medical and biomechanical factors, which in turn cause pain, discomfort or weakness. Our diagnosis and treatment plan is completely ‘hands-on’, focusing on how physical therapy can reduce pain and improve function. Many of our patients are self-referred and book in with us directly. We are also recognised by all major private health insurers. This would be useful if you wish to be reimbursed through any scheme that you (or your employer) subscribes to. Please ask us for further details and we’ll be happy to advise you. If you would like to book in with either Mark, Harriet or Serina, initial appointments (45 minutes, including treatment) are £55.00. Follow-on treatments for 30 minutes are £45. When you are competing at the highest level, you need to know that you are in safe hands! I had complete faith in Mark Browes; if it wasn’t for his physiotherapy and rehabilitation treatments, through a number of bad injuries at Liverpool, my football career would have come to a premature end. I thoroughly recommend Mark, he is not only a superb physio but also a good friend. I’ve known Mark Browes since 1999 when he joined the medical department of the first team at Liverpool FC. Since that time I’ve enjoyed a great professional and personal relationship with a man I’ve come to greatly admire. His professionalism and dedication is second to none. Having played for some of the top clubs in world football, I know that Mark is respected throughout the game. Mark will always be a friend. I suffered various knee injuries during my 5 seasons at Liverpool Football Club and Mark Browes was instrumental in getting me back to fitness each time. Following operations by Dr Steadman in Colorado, Mark took me through the complete rehabilitation process. It is due to his skill and expertise that I was able to continue playing at both Premiership and International level, proving that with the right treatment and care, a serious injury does not mean the end of a career. You can book online using the green button below. Alternatively, you’re most welcome to drop in and see our reception staff who can answer your questions and provide you with complimentary coffee too! You may also call us on 01244 37 37 57. If you find it difficult to look after your feet, our Chiropody services will be just what you need. We can provide the latest treatments for specific areas of pain. In your consultation and treatment we will discuss your massage needs and recommend the best approach for you. We are proud to be Chester's first clinic to use an Extracorporeal Shockwave Therapy Machine for the benefit of our patients. 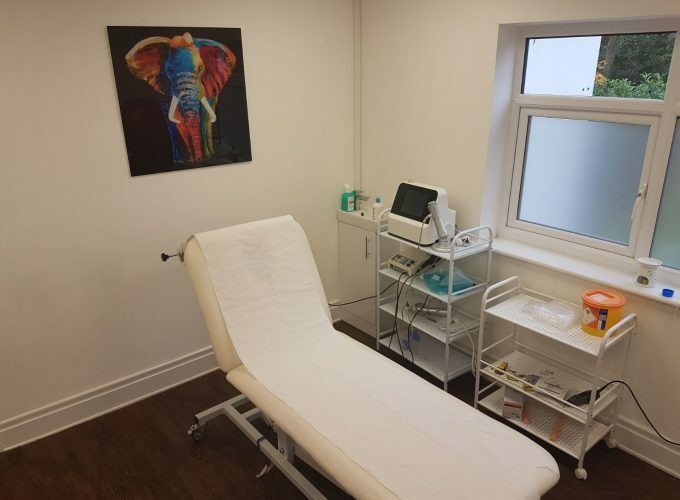 Our fully refurbished clinic is equipped to provide a full range of Clinical Aesthetic services.